Carnival Cruises offers the newest, grandest and most innovative floating resorts on the West Coast! Enjoy a Fun Ship Cruise for 3 or 4 round trip Long Beach. Better yet, relax on the fantastic floating resort of Carnival Miracle for 7 nights round trip Long Beach! Every week of the year Carnival Cruises offers Baja Mexico Cruises! Do everything. Do nothing. Do what you think is fun. No matter what Mexico cruise itinerary you choose, you'll love the informal, laid-back, be-yourself attitude that only happens on a Carnival cruise vacation! Hasbro, The Game Show - your favourite board games come to life in this fun-for-all-ages game show extravaganza. DJ Irie - Carnival has teamed up with the official DJ of the Miami Heat to keep onboard DJ's skills hot - and the onboard parties hotter. The Punchliner Comedy Club - hope you packed your funny bone, because renowned comedian George Lopez is helping Carnival make their comedy clubs funnier than ever. Playlist Productions - how about a show, to go? Carnival's theater is full of amazing musicals cruising along with you. Piano Bar - finally, a bar where dining along isn't just tolerated, it's strongly encouraged. Stage Shows - grab a seat in the main stage area for a performance that may literally knock your socks (or flip-flops) off. Live Music - music lovers, listen up. 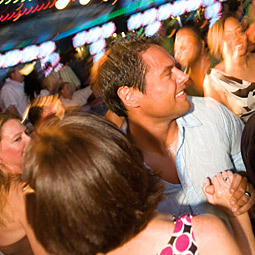 Carnival ships are rocking and rolling with some of the best bands at sea. Karaoke - channel your inner chanteuse, rock god or pop diver and wow the world (well, fellow guests at least). Nightclub - better pack your best moves 'cuz the Carnival dance floor is waiting for them. You ready to get the party started? Superstar Live - just like karaoke, except you're fronting a live band. So basically, not like karaoke at all. You've got a foodie in you - everyone does! 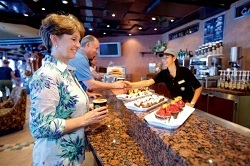 Awaken and delight yours on a Carnival cruise with delicious main dishes, tempting desserts and general yumminess everywhere you look. Seafood Shack - favor flavor above all? See your way to Seafood Shack for something simply delicious. Guy's Burger Joint - take a big juicy bite out of one of the best burgers at sea, brought to you by none other than celebrity chef Guy Fieri. BlueIguana Cantina - head on down to Carnival Mexican cantina, where the food is fresh and the atmosphere is fresher. Cucina del Capitano - sit down to a delectable family meal at an Italian countryside villa; in the middle of the ocean. Steakhouse - enjoy a premium steak served in an atmosphere to match. Green Eggs and Ham Breakfast - sit down to breakfast with the world of Dr. Seuss. Resort-style cruising, with an emphasis on style. Carnival includes 24-hour room service, a 24-hour room steward, soft & cozy linens (Carnival Comfort Collection), bathrobes, nightly turndown service, plenty of closet & drawer space, private bathroom and shower, television, individual climate control, telephone, and personal safe for valuables. All staterooms have two twin beds that push together to make a king-size bed. Many staterooms are family-friendly, which means we've got rooms that comfortably accommodate up to five people, plus rooms with an extra bathroom, which makes getting ready in the morning or winding down at night a snap. Plus, you'll never have to hear "quit hogging the shower!" again. If you're looking to keep the group together or just need the extra space, book connecting rooms and open the door between you for that instant 'second bedroom' feel. Cloud 9 Spa staterooms do things a little different than ordinary staterooms. For starters, we dare you to cross the threshold without feeling a little more relaxed. Once you're inside, you'll find pleasing decor and in-room amenities like exclusive shampoo and conditioner, shower gel and vitamin-rich body lotions. Details matter, so you'll also find spa-branded bathrobes and slippers to enhance your stay. What's more, your excellent stateroom choice gets you priority spa reservations, free fitness classes, unlimited access to the thermal suites and Thalassotherapy pool, exclusive discounts on treatments while in port... and more! And the best part? We've got a full range of rooms with that Cloud 9 mojo, from cozy Interiors to stretch-out Suites, ensuring you'll never have to sacrifice comfort for value. 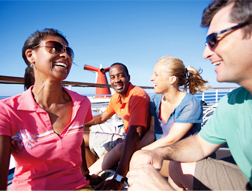 Carnival Journeys is a new limited series of special cruises that's made to amaze guests! It starts with a destination - Mexico or Hawaii. 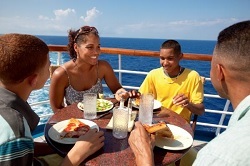 Carnival brings onboard authentic eats, local entertainment, throwback sea days, academy of fun, and crew connections. A Carnival Journey is about enjoying the most of a destination not only while you're there, but while you get there! Carnival Miracle will offer 15 Day Hawaii Cruise Journeys and one special 13 Day Mexico Cruise Journey in 2015-2016. We Offer Interline Rates and Military Rates! 7 Day Mexico Cruises Roundtrip Long Beach with Carnival Cruises From $439 US! 15 Day Hawaii Cruise with Carnival From $1069 US!